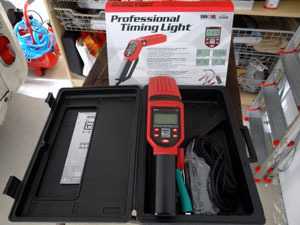 There are lots of variations in the design of the best timing light. Some models have a full set of features, while others are specifically made to test timing and nothing else. The trade off is that the more features you have, the bulkier (and costlier) the unit will generally be. For the contenders here, both types are represented, but emphasis is placed on lightweight, single purpose timing light guns. If you like to keep things simple, go with a basic model, but the more advanced Innova 5568 is always available if you need an all-purpose engine electrical tool that can do more than check your engine timing. Using a timing light is easy once you have the basics down. While a good OBD2 scan tool is used to diagnose ignition related issues in modern vehicles with electronic ignitions, older vehicles with distributors will be around for a long time. So if that’s your daily driver or a project/hobby car, a timing light is a great tool to have. The popular Innova 5568 is a professional quality timing light. In addition to ignition timing, you can use the 5568 to check Voltage, Tach and Dwell readings. For your convenience, it uses detachable cables, a definite advantage if you need to attach different cable styles, such as switching between ignition timing and voltage. The ergonomic design makes this Innova comfortable to hold, even at odd angles, and you can easily read the backlit display from almost any perspective. Instead a cheap plastic connector, this model uses a metal clip to put around your spark plugs wires, which is a lot safer, but can get hot quickly. The manual can be a little confusing at first, but most features are easy to figure out, and you will see why this unit is so popular after only one or two uses. The biggest complaint on the Innovus 5568 is that is does not support Multiple Spark Discharge (MSD) ignition systems. This is a common problem with timing lights, and the MSD website specifically mentions a need for MSD specific timing lights in working with their products. Watch the readings carefully when using the Tachometer functions, as the 5568 does have a tendency to “slip” the RPM synchronization under certain circumstances. 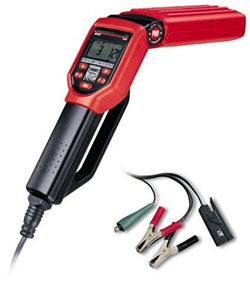 If you only need a basic timing light gun, the Innova 3551 should be near the top of your list. The swivel head means you can get to areas that other lights require you to perform minor acrobatics for, and it has a light that is bright enough to read in full daylight. It does not offer a lot of extra features, not even a Tach meter, but is priced right for the limited functionality. One feature that you will not find in most timing lights is the convenient Off/On switch that allows you to use the 3551 without keeping a finger on the button. The biggest complaint is that the shielded battery connectors are cheaply made, so you will have to be careful not to short it out, or use ordinary electric tape to reinforce the insulation. It is not made for commercial use, and may not stand up to a lot of rough handling. If you are a Do-It-Yourself type mechanic, the Actron CP7528 could very well be the best timing light for the money. It’s designed for you to use it with 6 and 12 volt systems, making it ideal for use with motorcycles. The Xenon bulb is bright enough for you to use outside in full sunlight, a feature that is lacking in many of the timing lights on the market today. The biggest complaint is that the CP7528 does not have a big variety of functions, and that can be an issue if you have several types of checks to perform. On the brighter side, being a specialized tool means that it requires fewer components, and that means less weight and an easier tool to handle. I bought one of these5568 thinking that it was near the best. I have now had 3 replacements and giving up on it. The degree function just does not work or is very erratic. 20 degrees and the spot does not move as the light is not changing. All have had the same symptoms. I have a straight 6 with electronic ignition. Innova say it must be noise. Any ideas what I can do …?? Roger, sorry you had issues with the Innova. In my experience, they make some of the most reliable timing lights out there but of course, there’s always a possibility of a lemon. What’s strange is that you’re having the same issue after multiple replacements. I have heard of a report where some Innovas are more susceptible to electromagnetic interference. Have you tried using it on a different vehicle? I’m assuming you purchased new from Amazon? I’ve had two of the ACTRON CP7529 timing lights. The inductive pickup on both of my units failed and the parent company Bosch which handles their repairs won’t fix the unit. I would NOT recommend their products. So far the best of 2018 seems more like the duds of 2018 :). I guess thanks for the post and thanks to the commenters warnings of bad experiences. I wouldn’t base the quality/reliability of Innova timing lights on a couple comments. This is by far the best brand in the biz. No product is going to have 100 out of 100 satisfied customers. Check out the reviews on Amazon, Walmart, Summit Racing, etc. It is very, very difficult to fine a quality timing light or dwell tachometer. The OTC timing lights are better but do NOT support magneto ignitions or MSD (crappy readings). The best shop instruments are from General Technology Corp, their GTC505 is a gem of an instrument. GTC does not see to have timing light, i would recommend OTC, MSD, or Ferret.